Open data - free, publicly available data - is being leveraged by 1500+ organizations in 87 countries across all sectors of the economy. When you look up the weather forecast, use an app to plan your commute, or check an online ratings site to find a local doctor, you're using open data. Open data - free public data, typically provided by governments, that anyone can use without restrictions - has become an integral part of our daily lives. It provides citizens, businesses, and nonprofits with critical information to make more informed decisions. This data can be found on government data portals or websites such as the United States' Data.gov or the World Bank's data site Data.WorldBank.org. 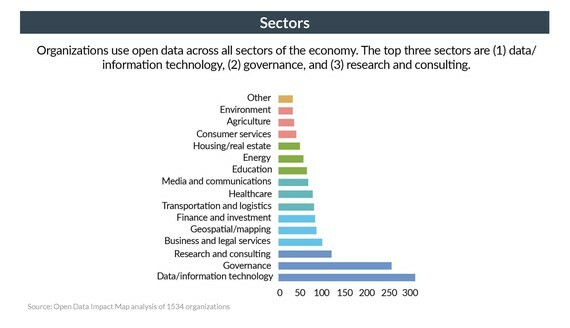 The use of open data across industries and types of organizations is broad and varied. From an entrepreneur in Ghana providing crop data to rural farmers, to a blogger discovering parking ticket errors in NYC, to a comedy news show using financial data to find inconsistencies in the Miss America scholarship fund, open data is being utilized across all sectors of the economy as a powerful free resource. In May 2015, the Center for Open Data Enterprise and the Open Data for Development (OD4D) Network launched the Open Data Impact Map - a public database of organizations using open data - to better understand the growing trends in different countries and sectors. 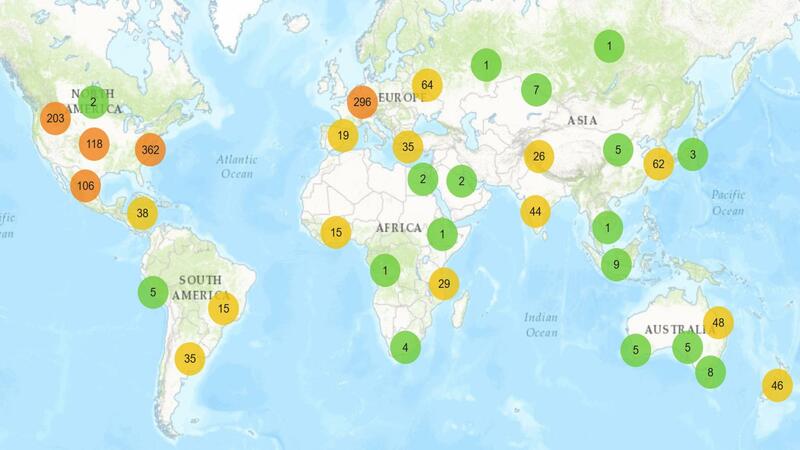 Over the past year, dozens of organizations and researchers across six continents have contributed examples to the Impact Map database, which includes information on the organizations that use open data, the types of data they use, and how they apply it. We are now pleased to release the first report of findings from the Map based on 1534 use cases from 87 countries. 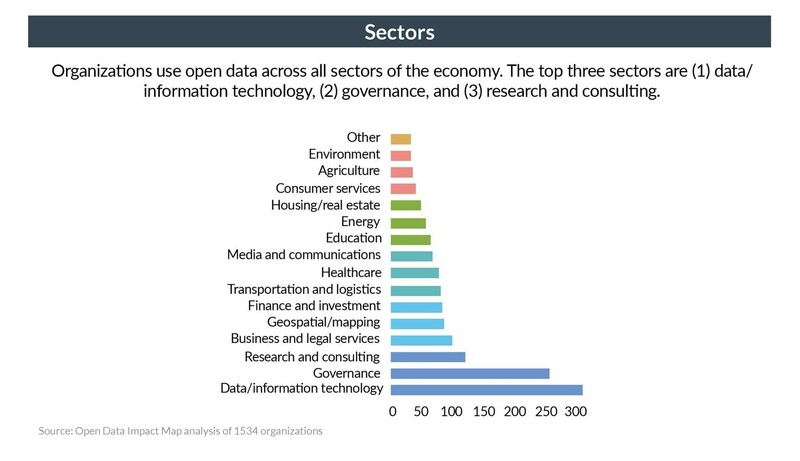 Our analysis of the Impact Map data has found the most common types of data used across sectors and regions are government operations (e.g. budgets, spending, elections, procurement data), geospatial (e.g. GPS data, satellite imagery), and demographic and social (e.g. census data). Organizational Optimization - All different types of organizations, from private companies to nonprofits, are using open data to improve the way they operate. For example, GPS data can help organizations to streamline processes and logistics to find the most efficient routes to ship their products. Economics statistics, demographic, and weather data can help companies improve market intelligence and assess new markets. New Products and Services - Hundreds of organizations have developed entirely new products or services based on open data. Many focus on making the data itself more accessible, usable, and easy to analyze, while others have developed new services or apps that produce insights and analytics. Advocacy - Organizations also use data as an advocacy tool for a variety of issues. For example several organizations use data on spending and procurement to expose corruption and inefficient allocation of resources and services. Several of these organizations are building digital tools to inform and engage citizens on issues ranging from transparency around school funding to addressing climate change. Research - Open data is fueling research in many fields. This work includes industry analysis, medical research, scientific exploration, and the use of data by journalists to inform and substantiate their reporting. We hope that the Impact Map can serve as a tool to help data providers and data users alike find the best uses for this public resource. The Impact Map is growing daily as we add new examples for analysis. We welcome your input, ideas, and insights to help develop the Map and its findings.